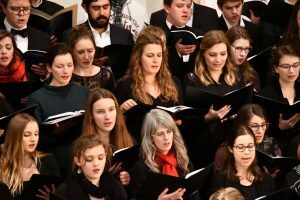 The choir of the Collegium musicum Bonn consists of about 120 active members most of which are mainly students but also include alumni, lecturers and externals. Since the summer semester 2014 cantor Ansgar Eimann (Conductor) is directing the choir with regular assistance of a répétiteur. Our work focuses on oratorical pieces which are normally rehearsed and performed in close collaboration with the Collegium musicum Bonn symphony orchestra or the Academic Orchestra Bonn. Where appropriate, professional soloists complete our performances. A selection of our musical repertoire over the last semesters comprises of Bruckners mass in e minor, Mendelssohn’s Walpurgisnacht, Verdi’s Requiem, Mahler’s 2. Symphony (in cooperation with the choir and orchestra of the University of Cologne), Mozart’s Requiem in Robert D. Levin’s complemented version and Rossini’s Petite messe solennelle completed by instrumentalists on Harmonium and piano. More recently we worked on Mendelssohn’s Elias, Mozart’s mass in c minor and Schubert’s mass no. 6 in E flat major, the first and the latter in cooperation with the Collegium musicum Bonn symphony orchestra. Last, we performed Bach’s cantata “Wir danken Dir, Gott” (BWV 29) as well as the motet “Singet dem Herrn” (BWV 225) at our closing concert of the summer semester 2018 in collaboration with the Academic Orchestra Bonn. Occasionally, we present additional a-cappella programmes, as for instance during the concert tour to the Prague Choral Summer Meeting in August 2016. Not long after the beginning of each semester, most of us participate in the external rehearsal weekend, to intensify the work on our pieces as well as to get to know each other better or tighten already existing friendships. Later on during the semester, a second rehearsal weekend in Bonn follows. Two concerts are performed at the end of each semester.